Traditional trade show marketing, via exhibits on the trade show floor, certainly has its merits — meeting customers face-to-face, learning about competitor strategies, seeing what’s new in the industry. But for some companies, the ROI from trade show marketing can be difficult to quantify. And in an era where technology is replacing face-to-face engagement, the trade show game is changing. Meanwhile, the expense involved to participate as an exhibiting organization has only become more glaring. As I write this, it’s currently about two months out from what is arguably the biggest gathering of the year for the construction industry: Design & Construction Week. The January event comprises two major shows: the National Association of Homebuilders 2018 International Builders Show (IBS) and the National Kitchen & Bath Association’s Kitchen & Bath Industry Show (KBIS). Some 80,000 building industry professionals are expected to attend the Orlando venue, where they could visit booths from around 2,000 exhibiting brands. With just two months to go, decisions to exhibit at the show have already been made. Some construction industry manufacturers are knee-deep in planning their presence, while others, having decided not to exhibit, may need alternatives. No matter which camp your organization falls into, we see both sides of this story. Here, we offer some key marketing tactics to consider to help build face-to-face engagement and achieve a stellar, measurable return on your investment, with or without the exhibit booth. Perhaps you’re an organization that has elected not to exhibit at this year’s major industry show. A number of considerations likely went into this decision. Maybe you find it difficult to justify the large expense, feel you have fewer choices on how to execute your plan, or simply want to try something new. All are logical reasons for what may be a departure for your organization. The good news is that exhibiting at major industry trade shows is not mandatory or marketing de rigueur. Building products companies can choose to spend their marketing investments in other ways. And those that have trouble tallying the value in investments like this, probably should. But, your face-to-face marketing strategy can’t simply go away. Organizations still need to find and fund a marketing strategy to keep their brands relevant with buyers and facilitate the face-to-face connections they are forgoing. Stay in the game. Even if you don’t plan to exhibit at the next show, it’s still a good idea to send a team of core marketing and sales professionals to attend. Instead of manning the trade show booth, these representatives can use their time to collect and gain the invaluable business intelligence they may have missed in prior years, such as discovering competitor strategies, gleaning knowledge from workshop sessions, and holding impromptu fact-finding conversations throughout the halls and on the trade show floor. Set specific goals. Before heading to the show, establish a set of key performance indicators (KPIs) to justify your reasons for being there and keep you accountable to those intentions. For instance if you hope to engage in meaningful face-to-face customer interactions during the event, your KPI might be hosting at least four lunches or dinners with your most important customers. And, if you’re seeking increased business intelligence, plan to secure photos of every competitor’s exhibit and sign up for their customer relationship management (CRM) programs to take stock in various approaches. Host an event that gets noticed. Consider hosting a creative, memorable event in tandem with the show. You could hold a private breakfast by invitation only. Or sponsor a specific workshop, refreshment break, or general session. Whatever you decide to do, make sure it’s original, relates to your brand story, and is memorable enough that your clients will want to tell colleagues about it. You may be part of that select group that will be exhibiting at the industry’s biggest trade show. It’s great news, since you’ve committed to creating the classic showroom experience for increased customer engagement. But, in this new hyperconnected environment, you should also take care to maximize the increasingly time-crunched opportunities you are likely to have. Plan it out. 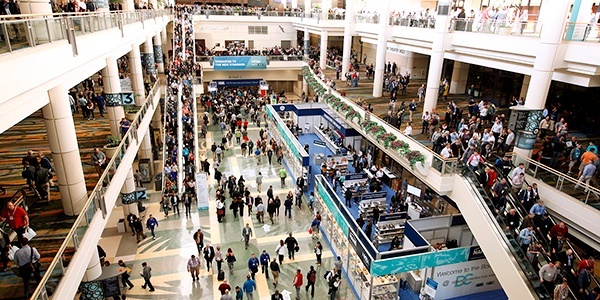 What will your trade show experience look like? How will you draw attendees into the exhibit, start conversations, qualify your prospects, and then keep the conversations going? All of these questions and possible scenarios, should be planned out. You should be able to predict the conversations you will have, as well as how you will guide each prospect through the appropriate buyer’s journey. Have an end game. As with non-exhibiting companies, establish clear KPIs in advance of the event. How many leads do you expect? What proportion of new sales are expected to result from current customers? And what proportion from new customers? Keep the show going. After the show floor closes, how will you keep these conversations going? Figure out the followups for customers in the pipeline, and how you will nurture your new leads across brands. Ultimately, the trade show experience for both exhibiting and non-exhibiting companies, should deliver the same outcome: opportunities to connect face-to-face with prospects, current customers, and peers in the industry. And, it should facilitate effective followups on those relationships, to let buyers know you haven’t forgotten their questions, concerns, and goals. Finally, measuring your results will indicate whether you are on the right track, or need to make changes. For more Point To Point insights on how to create customer engagement that builds your brand story, contact us.